Q: RON: I wanted to tell you that I just looked at your photos. You grow more beautiful as time goes by. You are simply gorgeous! I build guitars and was wondering if anyone has made a guitar just for you, your own Teresa Brewer guitar. It would be an honor for me to do it for you. A: TERESA: "No, no one has ever made guitar for me. I don't play the guitar, although I use a fake one in my act. 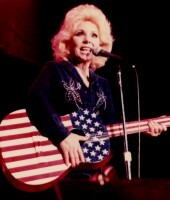 It's red, white and blue with no strings and is used as a prop while I sing 'Thank God I'm a Country Girl.' The guitarist in the orchestra does some fancy picking and I pretend that it's me. Of course it's obvious to everyone that it's not!"